This old, sweet herb was naturalized in North America so long ago that some think it a native. Catnip flavored with honey was a favorite aromatic tea of early American colonists. Catnip provides a harmless high for felines and is beneficial for humans as well. Catnip leaves contain considerable quantities of vitamins C and E, both excellent antioxidants. The primary phytochemicals, nepetalactone isomers, are mild sedatives, somewhat like the active ingredients in valerian. (source) Catnip is a gentle but potent sleep-inducer that calms without affecting you the next day. At the first sign of a cold, drink a warm cup of catnip tea, and bundle yourself off to bed. Catnip soothes the nervous system and can safely help get a restless child off to sleep, in fact catnip, along with chamomile, is one of the most often recommended herbs for use in childrens complaints. A warm cup of catnip tea will relax nerves, help with sleep, and is safe enough for the whole family to enjoy. Its mild taste is reminiscent of mint but without the sharp menthol notes. 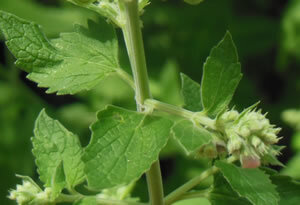 Catnip is a safe and effective herb for animals digestion, colds. Catnip brewed as a tea does not have the "feline high" effect, but calms nervous animals. Add a few fresh leaves to drinking water, or mix a small amount directly into food. Recipe Instructions: Herbal Tea :Use 1 heaping teaspoon or two of dried catnip tea to each cup of water.